It's been a busy couple of weeks here as Olympic fever has taken hold of my six year old. This means I've learnt more about the history of the Olympics and watched more sports over the past two weeks than I've probably done in my entire life! Finding time to update a blog between hosting our own toy Olympics has been tough. I finished a cardigan for M a few weeks back and thought I'd better write it up while I still have access to the computer. It will undoubtedly be co-opted for something sport related in a short while. The simple Sirdir cardigan which has been my go-to pattern for M over the past couple of years, only runs to age 6-7. I'm considering whether to resize it, but in the meantime I need to branch out and try other patterns. The only thing is, there don't seem to be a huge selection of sweater patterns for little girls. And of those that are available, the field becomes even narrower when considering the child in question's personal taste. 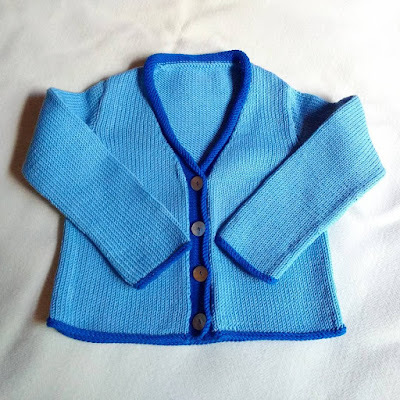 Honestly, there is no point spending time knitting a cardigan for a small person if she doesn't like the end result. After some thought, I eventually settled on Phoebe (Ravelry Link) from Sublime Yarns. 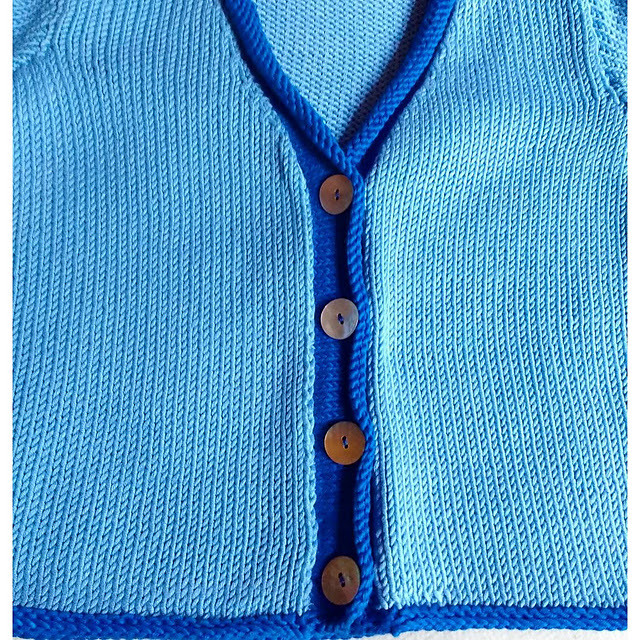 This is a simple, close fitting cardigan, with a 'V' neck and contrasting band around the collar, front, hem and cuffs. 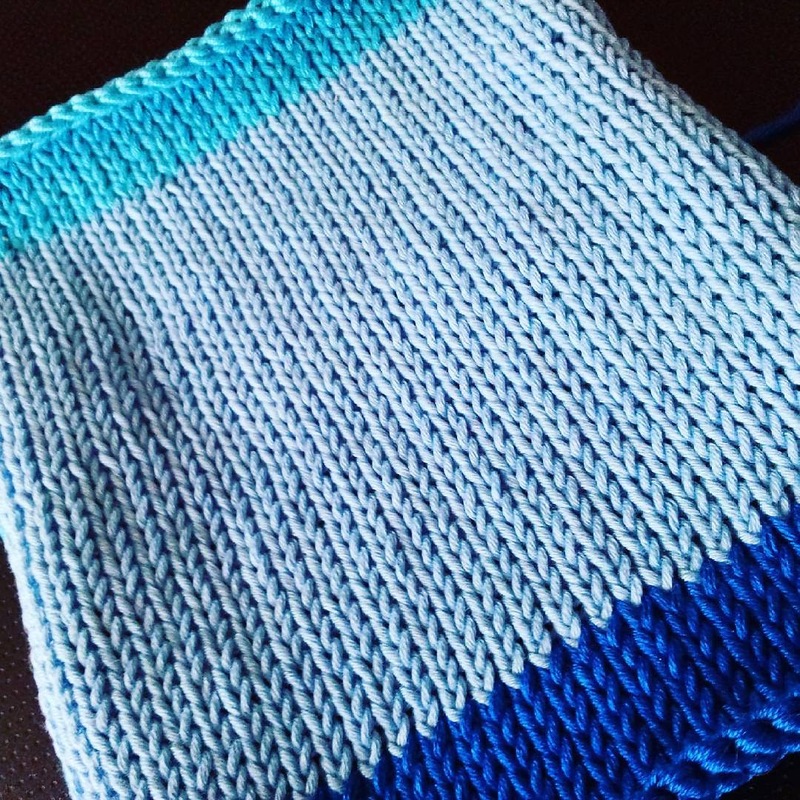 I decided to knit as close to the pattern as I could, rather than fiddling around and modifying it as I usually do. I was hoping this would make my life easier. Until of course, I tried to get gauge. The short version of this story is I couldn't. 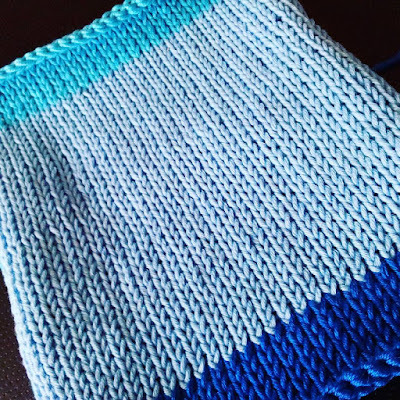 I like the Drops yarns from Garnstudio, and having used a dark blue Muskat for M's last cardigan, I'd decided to use the light blue for this one. 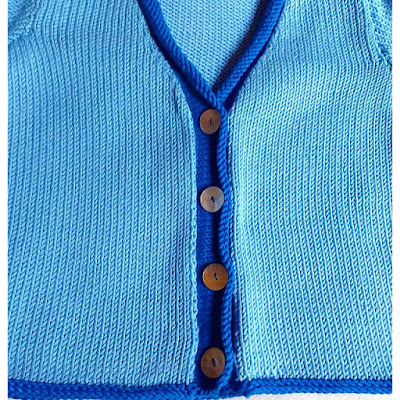 For contrast I had to choose between turquoise and the left over dark blue from the previous cardigan. Swatch to consider contrast colours. After swatching, the dark blue won. It wasn't that I didn't like the turquoise, but it just didn't pop in the same way the darker blue did. Matching tension proved to be something of a problem. 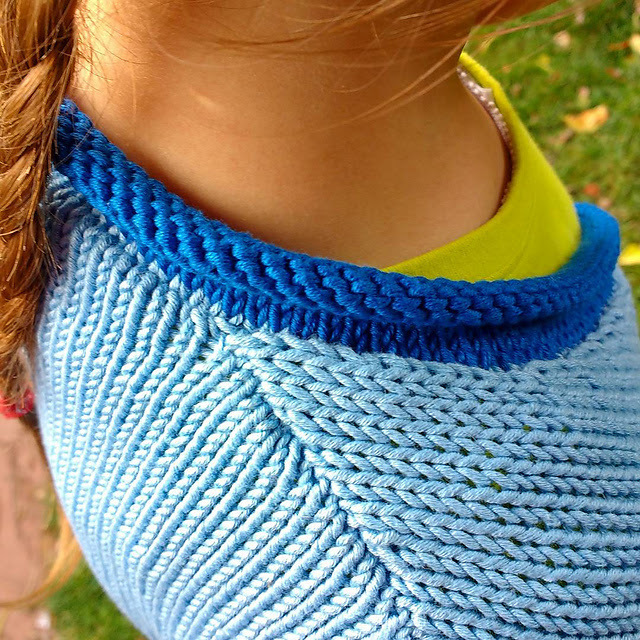 The pattern for Phoebe requires 10cm = 22 stitches x 28 rows. The Drops Muskat is a calendered cotton with a high sheen, very pretty and with good stitch definition. It also has an expected gauge of 10cm = 21 stitches x 28 rows. I'd not been able to match the required tension for the last time I used Muskat, but it hadn't worried me too much. 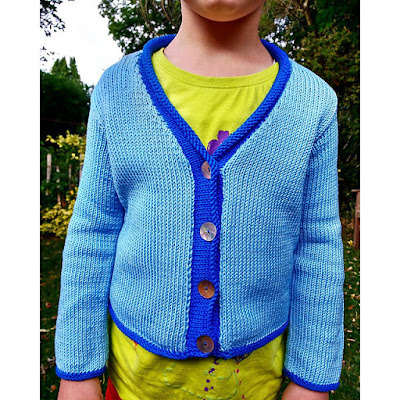 I deliberately loosened the tension, going for a swing type cardigan and making the finished garment bigger. The downside was I went through a lot more yarn than I expected and had to order more to be able to finish the project. 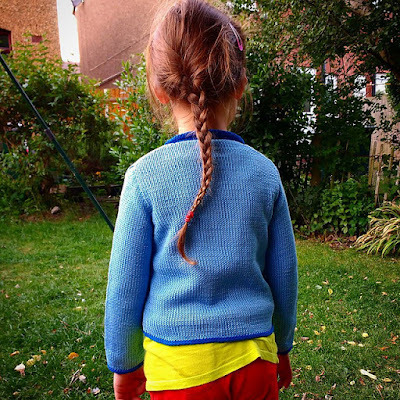 With Phoebe, I wanted to knit as close to gauge as I could and end up with a finished garment sized as described in the pattern. This proved a problem for me as I could not get the Muskat to knit to the required tension. I had to settle for the expected gauge for the yarn, i.e. 21 stitches, rather than 22 stitches. My working needle was 3.75mm and 3.25mm where the pattern asked for a smaller needle. That difference of 1 stitch over every 10cm adds up and in this case would have resulted in an increase of 1.5cm around the chest. Thinking about this retrospectively, that doesn't sound too bad and is certainly able to be absorbed into ease but would have resulted in an inevitable looser fit. After my previous experience with this yarn, I was also worried that I'd knit a lot more yarn than expected and run out, which would raise the issue of matching dye lots. Some deliberation later, I decided to adjust the cast on numbers for the pattern to match the new expected tension of 10cm = 21 stitches x 28 rows. Naturally this meant adjusting all expected stitch counts throughout. Other than that, I knitted as directed, matching lengths to pattern directions. I deliberately knitted one size up, resulting in a cardigan which is a little too large on the shoulders, but not so big as to look silly. Sitting reasonably well on the shoulders and across the chest. For future cardigans I need to remember that M is tall for her age, or at least compared to the children the pattern designer has sized for. Even though I added 1cm to the sleeves and 2cm to the length of the body, as you can see from the photographs, the length is actually spot on for M right now. The back view, showing the hem at exactly the right length. I'm a bit disappointed with this. I was hoping to get two years wear out of the cardigan, but now expect it will be too short for her by September next year. Lesson learnt, add a lot more for length on future garments. It is worth mentioning that I'm not an experienced cardigan knitter. Apart from a baby cardi I made while I was pregnant, I've only knitted one child cardigan pattern before, albeit making it up three times. In this case, the cardigan was a straight forward knit. There were differences in approach to handling the decreases to my previous experience, but nothing terribly difficult to understand. The fun came when I tried to make the collar. I've never tried to pick up stitches for a collar before and the results were messy. Very messy. In fact, it was so bad that I ripped the whole thing out and started again. Normally I'd have reached for a crochet hook, adding my own collar and front, but resisted the temptation and instead dug out my copy of Montse Stanley's Knitting Handbook. This hefty tome is one I think every knitter should have on their shelf. 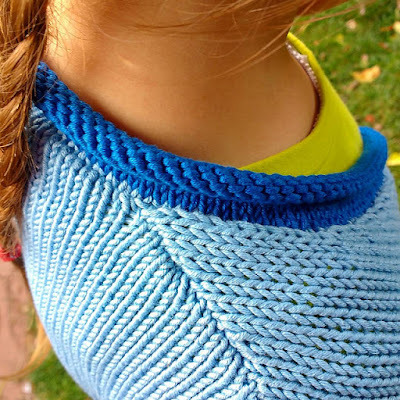 It is a reference work of so many different techniques, with advice on everything, including how to handle picking up stitches for a collar. Following the advice in the book, I picked up the stitches in the main knit colour, which acts as a foundation and masks any irregularity in the stitching. Once the stitches were on the needle, I switched to the required contrast colour to work the rest of the front. The rolled collar - look carefully and you can see the foundation row in the main colour. The other area to give me problems was the button holes. I couldn't understand the instructions in the pattern. By now, I was truly fed up with the collar and front, so I did my own thing. I had a quick hunt on YouTube for examples of button holes, which I followed instead of the pattern. Buttons as chosen by M.
The end result looked OK, were the expected size and in the right place, but were not made in the way directed by the pattern. 6 x Garnstudio DROPS Muskat 50g - Light Blue. 1 x Garnstudio DROPS Muskat 50g - Blue. M was pleased with the result and other than it not being as long as I wanted, I think the cardigan came out OK, so overall I'm happy with this.